Karnal in Haryana is a part of the National Capital Region and has been vastly associated with Indian History. For the residents of Delhi and other nearby destinations seeking to relish the experience the luxury of a historical hotel, Heritage hotels in Karnal are the nearest choice. The city has roots back in the Mahabharata era. Legends claim that it was founded by Raja Karna, the eldest son of Kunti. The historical associations continues till the Mughal Era and the British Raj. The glorious bygone days can be relived with stay in the heritage hotels in Karnal. Heritage hotels are inspired by India’s rich heritage designed with intricate details to capture the authentic essence of traditional Mughal and Rajputana styles of architecture. The property exudes five star luxuries for all its guests. The modern conveniences catered to the guests are extravagant. From well-appointed rooms, gastronomical 5 star dining, pampering spa and games, en suite bathrooms, LCD TV, room service, laundry, conference or banquet halls, spacious gardens and much more. 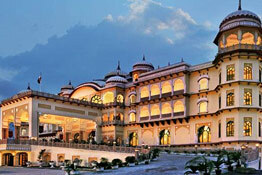 Create wonderful experiences, check out best options of heritage hotels in Karnal.